The only magazine dedicated solely to mental health in the UK were media sponsors of the 2018 Mind Media Awards, which is now in its 25th year. The Mind Media Awards celebrates the best portrayals of mental health in the media industry. The awards ceremony recognises not only achievements in this area, but encourages more writers and producers to create material that has a positive impact on people. Happiful magazine, which aims to break the stigma of mental health, are proud media sponsors of the event. That’s alongside headline sponsor Virgin Money Giving, the UK’s largest not for profit online fundraising website. On the night, the ceremony was hosted by Stephen Fry, who is the president of Mind. The event was held at the Queen Elizabeth Hall, Southbank Centre and the guest included celebrities and Mind ambassadors Fearne Cotton, Frankie Bridge, and Dame Kelly Holmes. Winners included Clarke Carlisle, founder of Clarke Carlisle Foundation of Dual Diagnosis. Clarke and his wife Carry Carlisle accepted the the speaking out award which recognises people who have shared their own experiences of mental health problems. What’s more, other forms of recognition such as The Making a Difference award, sets out to acknowledge media that initiates change. This was awarded to Hollyoaks for their campaign, #DontFilterFeelings. The BBC network took home awards for the BBC News at 10 coverage of mental health issues and the Drama Award for their adaption of award-winning play Overshadowed. Alongside this, documentary Girls on the Edge and podcast I Hear Voices won the broadcaster further recognition. 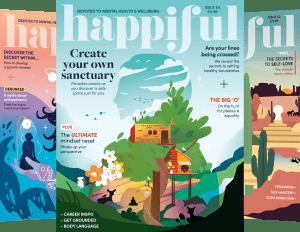 To read more about the work of Happiful magazine or read the latest issue visit the website here. To find out more about the mind media awards and the 2018 winners, visit Mind.